“A grilled ham and Swiss, please.” No, this not your typical, lowly, grilled ham and cheese sandwich. This sandwich becomes, oh, so much more, when Frenchified. The Croque Monsieur is, by far, the most popular and most quintessential of Parisian bistro fare after the roast chicken and steak frites. The sandwich consists of thin slices of ham and gooey Gruyère nestled between hearty slices of country bread, and slathered with a creamy béchamel sauce. You can turn it into a Croque Madam by topping it with a sunny side up egg. Serve it with a side of leafy greens, and you have a quick meal-so French in its simplicity and sophistication. In Paris, pain Poilâne is the bread of choice. With good reason. Their beautiful loaves provide a slightly crunchy yet chewy crust with the hint of sourdough and a tender middle. After a few days (if it lasts that long!) the crust grows firmer and the sourdough becomes tangier making it the best bread for flavorful tartines or breakfast toasts with jam and butter. Poilâne’s main shop is on the rue du Cherche-Midi, in the heart of the 6th arrondissement, and is always one of the first places I visit when I am there. I can’t resist picking up a whole loaf and one (or three) of their divine, buttery, apple tartlets. In NY, I am lucky enough to have several terrific bakeries to choose from when I am in need of a good bread. Two such bakeries are located on opposite ends of Manhattan. Orwashers (http://www.orwashers.com/) is on the upper east side and Pain D’Avignon is on the lower east side (http://www.paindavignon-nyc.com/). Despite these distances, separated only by a subway ride, I am lucky in that I can pick up bread from both bakeries at my favorite food market, Fairway on the upper west side. I love the bread from Orwashers and many of their loaves come wine- and beer-infused, which is really interesting and fun to pair with different cheeses and meats. They do have many traditional bread recipes as well, and while they are also famous for their massive hand filled doughnuts, their black and white cookies are the best in the city. (IMHO) But you do have to make the trek up to their store to enjoy those! If you find yourself on the lower east side, hidden away in the Essex St. Market, you can find the first retail outlet for Pain D’Avignon. Long before this shop opened, Pain d’Avignon had been supplying prestigious NYC eateries like Eleven Madison Park and Momofuku with bread from their wholesale bakery in Long Island City. Their sourdough breads and croissants are truly terrific. For this iteration of the Croque Monsieur, I am making one sandwich from each, a Pain D’Avignon Sourdough and an Orwashers pain de campagne. They both had different levels of sourdough flavor; the Pain D’Avignon was much more like a SF sourdough and lighter in color and texture while the Orwashers’ pain de campagne had more crumb and a grainier texture. Both are just right for making this amped up grilled cheese! The béchamel for this recipe is made with a dash of cayenne pepper instead of the traditional nutmeg but you can also add a dash of nutmeg if you would like. Just be careful not to add too much salt as the ham is also salty. A few years ago I received Panini press and it’s been sitting in my basement pantry for quite a while so I pulled it out, cleaned it off and used it for the first grilling of the sandwiches. In the recipe, David doesn’t just say to brush the slices with butter, he says to brush them without restraint with melted butter. And that’s exactly what I did! Once the sandwiches were golden brown and toasted, I moved them to a cast iron skillet for final cheese melt under the broiler. The first bite, the crunch of the crust, the buttery toast, the oozing cheese and béchamel and the salty ham, it’s what grilled cheese dreams are made of. At least, French ones. Welcome to January! Hope you have all had a nice long break and are ready to start the new year. I spent most of my break going room to room in my house emptying closets and drawers, making bags for donation and bags for garbage. I purged quite a bit and still feel I could make one or two more rounds and will probably spend a few more weekends doing so. It’s amazing how much you accumulate! One book that arrived recently is Ruth Barnes’ Sharing Morocco: Exotic Flavors from My Kitchen to Yours. The title is was what drew me in. I love Moroccan food and hoped that this book would guide me in making traditional fare at home. 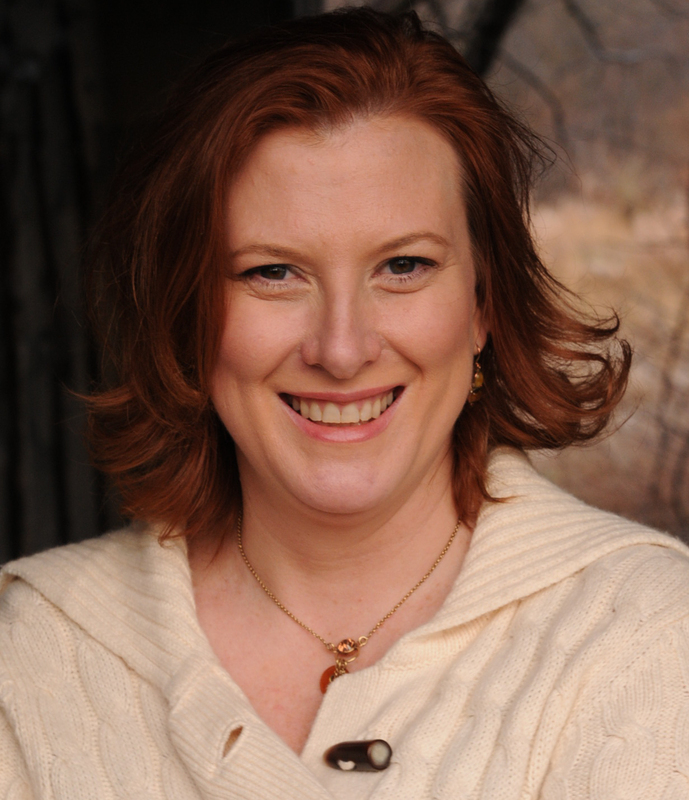 Like so many home cooks, the author, Ruth Barnes, is a busy spouse, parent, and professional who cannot spend all day in the kitchen preparing complicated meals. Her goal was to make the cuisine accessible to the home cook. In the book she shares tips and techniques for preparing Moroccan classics like bastilla, lamb with apricots and prunes (my re-creation above), and chicken with preserved lemons, as well as more familiar dishes like baba-ganoush, baklava, and kebabs. The recipes have been quite simplified and she identifies several common ingredient substitutes and breaks down the complex spice combinations so often found in Moroccan cuisine into manageable formulas. What is left are such easy recipes that anyone can make these dishes in their own home. I made the Lamb Tagine with Apricots and Prunes. It’s a fairly quick “stew” that doesn’t require a lot of preparation but figure about 2 hours and 15 minutes total cooking time-so it’s better for a weekend dinner than a midweek meal. I hardly expected the kids to like the flavors but was pleasantly surprised when they all did- even my pickiest eater. While not so pretty to photograph, the dish tasted very good and I would make it again. I served it with a side of Israeli Couscous that was cooked in beef broth with sauteed onion. In a cooking tagine or Dutch oven, heat the olive oil and brown the lamb on all sides. Remove the lamb to a platter. Saute the onion for about 5 minutes until they begin to soften. Return the meat to the pan and add the cinnamon, ginger, turmeric cumin, cilantro, salt and pepper. Continue cooking for 2 minutes. Add the beef broth. Lower the heat, cover, and simmer 1 hour 15 minutes. Stir in the honey, apricots, and prunes and cook for a further 15 minutes. Remove the lamb ad fruit from the tagine and place on a serving tagine or platter. Spoon the sauce over the meat and fruit. Garnish with the walnut halves and sesame seeds. Disclosure: Thank you so much to the Lisa Ekus Group for sending me this copy of Sharing Morocco: Exotic Flavors from My Kitchen to Yours by Ruth Barnes. Recipe reprinted with permission. I don’t eat tuna, thon, atun, tonno or however you want to call tuna- unless I have to. I try to avoid it as much as possible and even have a separate can opener for those rare cans that are opened in my house. I don’t understand why, when you order a salad abroad, that they must toss a can of tuna on top. All across Spain as I hiked the Camino and even in Italy, when I just wanted a nice bowl of greens, when I craved greens, it would arrive topped with a can of tuna-much to my dismay, as though the greens the needed something. They don’t. I would prefer them to be plain or with just a bit of a oil and vinegar and a dash of salt would have been sufficient, thank you. 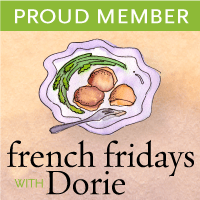 So, I am skipping this week’s tuna rillettes for French Fridays with Dorie (duck rillettes, on the other hand, are a favorite!) and since I actually made these recipes the weeks they were assigned but never had the time to post them, I thought this week, I’d play catch up. 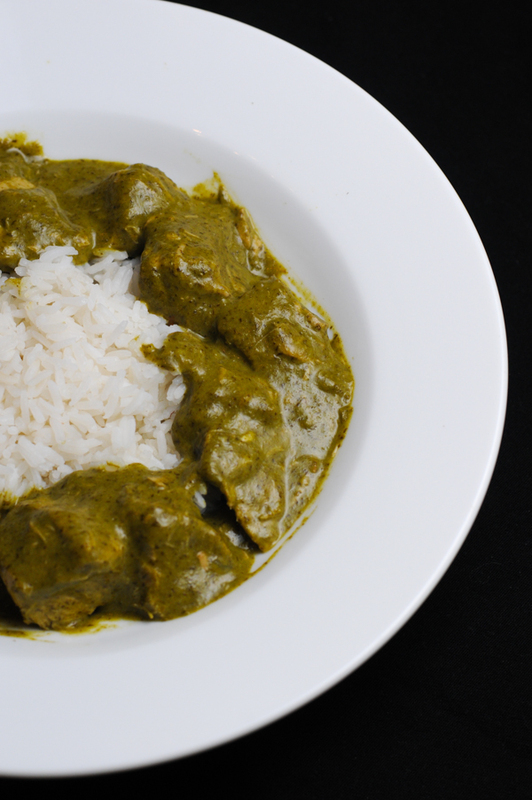 Veal stew as green as Spring, who’d ever heard of such a thing? Brown, and white I’ve enjoyed before, but green, that’s one I had never seen. My blender pulsed and pureed, and from the lid it did spray. A Springier green I had never seen, it was bright,and vivid and oh, the veal was incredibly lean. I poured the sauce onto my plate and took some pictures before I ate. I am keener than keen to eat veal that’s greener than Spring. I was pleasantly surprised with this one. While it doesn’t look so appetizing, (I find stews and sauces like this hard to photograph!) the sauce- a combination of mint, parsley, spinach and thyme was delightful and bright. It made for a terrific Spring dish. And veal, of course, is quite apropos for Spring as well. The sauce would be excellent over chicken or fish as well. And a lighter version would taste great with grilled vegetables. 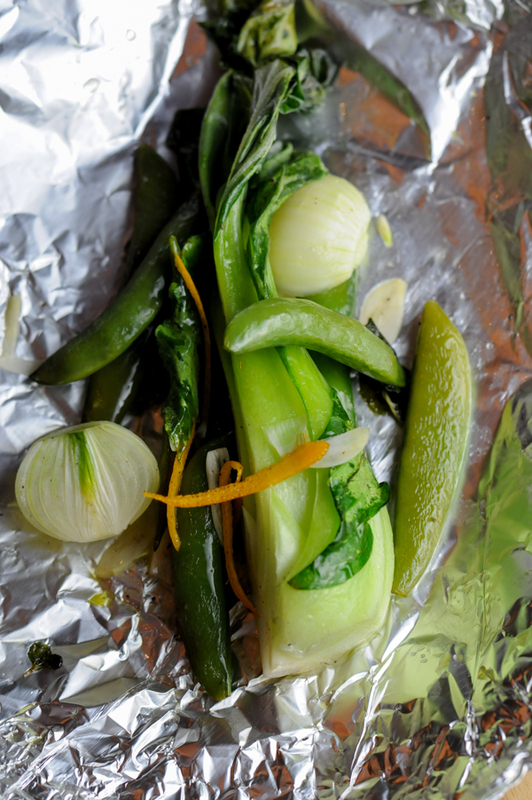 Speaking of vegetables, there was also Baby Bok Choy, Sugar Snaps and Garlic en Papillote. A simple mixture with baby onions and orange zest, steamed in little pouches in the oven. A lovely and light side dish for any meal. I would definitely make both of these again, or at least the sauce from the veal, and vegetables in papillote happens quite a bit around here- it’s quick and easy! Which is what I need these days!